Press the Buttons (via Blake J. Harris, author of Console Wars) got their hands on an official Nintendo Character Manual from 1993. In it, the company sets guidelines for Pantone coloring, character size, feature details, and more. 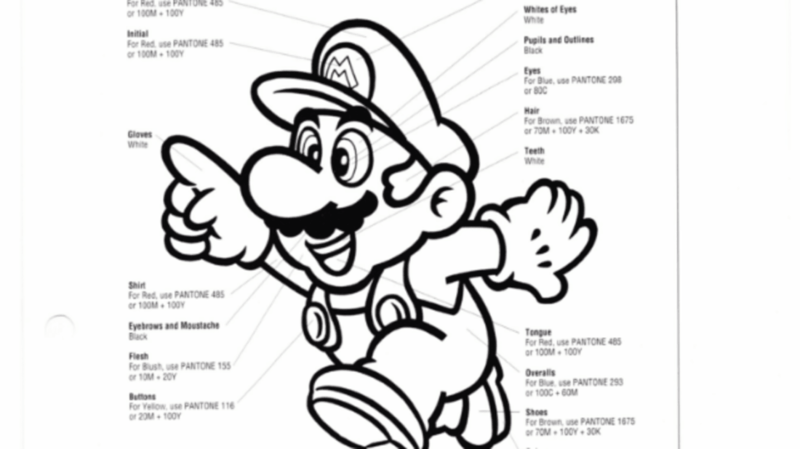 The internal and "confidential" guide also gives some in-depth info about Mario, his world, and its varied cast of creatures. If you've been waiting 22 years to find out where Toad's family lives or what Yoshi's full name is, today is your lucky day. 1. Mario Was Born In Brooklyn. There is a full biographical section on Mario, which serves as a sort of Portrait of the Plumber as a Young Man. "Destined to he a plumber," it says, he "grew up with a love of fixing things," which started when he "fixed a friend's squirt gun." 2. Mario's Mission Is Two-Tiered. According to the manual, he is "unflagging in his for crusade for justice and clean bathroom fixtures." 3. Mario Might Be Of a Uniquely Named Species. Although he is referred to as a "man" throughout the guide, the section on Yoshi lists Mario's binomial nomenclature as homo nintendonus. 4. He Has An Eclectic Taste In Music. He loves "either opera or new-wave, high-techno Euro pop." Not sure if the dungeon music counts as "high-techno Euro pop," but it certainly is a sinister club banger. 5. Mushrooms Are His Favorite Food. Which makes Mario an unusual and ironic savior of the Mushroom Kingdom. Watch your back, Toad. 6. Luigi Is His Younger Brother. And he spent his childhood "handing toy plungers and spanners and plungers to his older brother," Mario. 7. Artists Had To Be Careful With Luigi's Hat. "Do not flop art," is the style guide's warning. Unlike his brother's "M," Luigi's "L" is not symmetrical and would appear backwards if an artist merely flipped his image in an effort to save time. 8. Princess Toadstool Is The Daughter of The Mushroom King. His fate is unaddressed specifically in the guide, however. The Princess, meanwhile, is "the only hope for the reanimation of the mushroom people." 9. Her Blush Is A Very Specific Shade. Pantone 155, to be exact. 10. She Uses Magic To Dry Clean Her Clothes While Imprisoned. It is her "power of white magic" that "keeps her elegant gowns starched and clean even in Bowser's dark and filthy dungeon." 11. Bowser's Motivation Is Petty. Why go through all that trouble and hard work to conquer the Mushroom Kingdom? "Because he could not stand the idea of happy fungi." Come on, man. 12. How Was Toad Able To Escape Death or Enslavement? Naturally, he "was off visiting relatives in the Fungus Federation at the time of the Koopa War." As Press the Buttons notes, this internal corporate guide the only time the "Fungus Federation" is ever mentioned in the world of Mario. 13. Yoshi Has A Full Name. He is "properly known as T. Yoshisaur Munchakoopas." 14. Yoshi Must Always Face To the Left. There is no reasoning behind this one, but the style guide is very specific about this (even if it depicts Yoshi facing right on subsequent pages). 15. Wario is *NOT* Mario's Evil Twin. Check out more pages from the guide at Press the Buttons.